Jay Lawson was kind enough to take our poor old 1942 Ford Jeep under his wing. The Jeep had been on display in another museum for many years and she had gone down hill badly. She hadn't run in years and the fuel system turned to syrup and the brakes were bad. Jay took the Jeep away on a trailer and brought her back in great shape. He not only put a new starter on her and got the engine running but he overhauled the brake, did body work and painter her up real purty! I can't thank you enough Jay for your awesome hard work and dedication to this great old Jeep. She runs great and will enjoy running around the airport and heading off to military vehicle shows. Thanks Jay! This is Brian Tressler who has been helping out around the shop. He is very enthusiastic and is a great help. Brian is shown here working on the new R985 for the Beech under the watchful eye of Annie the Super Dog! Brian Tetreault has been helping out quite a lot around the museum lately. 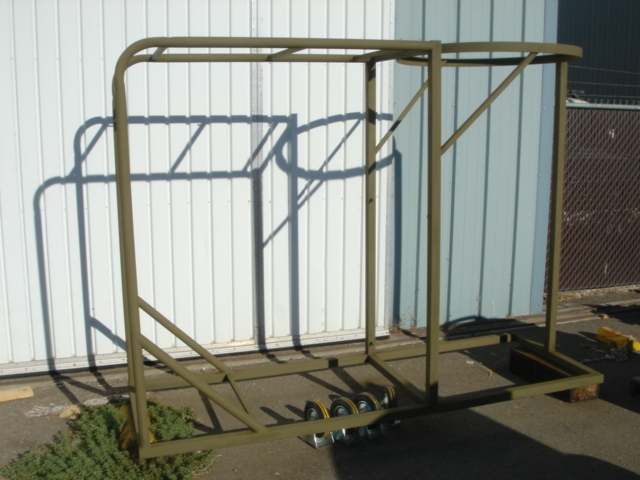 He built and painted the stand for the Central Fire Control turret system and is in the process of making the wood floor, side panel and top. Brian is another one of us nuts that loves Warbirds and can't get enough of these great old planes. He also built the decking for the ball turret stand pictured below. Thanks Brian for all of your awesome help! Jimmy Ricketts has been at it again. Here is the finished ball turret stand that Jim built. 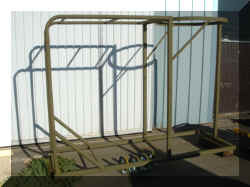 The stand was designed after an original WWII turret stand that I saw in storage at the National Air and Space Museum. It was made using the same tubing size and gusset patterns but we only put a ladder in on one side instead of both sides like the original. The stand is sitting on top of a WWII bomb service trailer made by Saginaw Stamping and Tool. 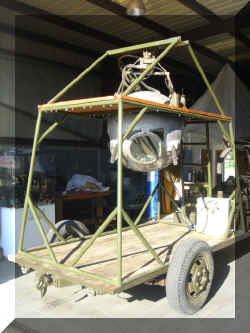 This stand has made the ball turret fully functional and it was taken on its maiden flight by the famous 8th Air Force ball turret gunner Wilbur Richardson. At our Gunnery Symposium he demonstrated the ball turret to a big crowd and then answered questions from atop the turret. It was a great display which was made possible by Jimmy Ricketts. Thanks Jimmy for all of your outstanding work! We needed a stand to display the Martin 250 Turret so Jimmy Ricketts took up the task and built it. Here Jim is grinding one of the uprights for a tight fit to the ring. Jim and my daughter Sydney are justifiably proud of their new paint job on the turret stand. The fruits of their labor and a great stand for the Martin turret! Andrew McCue has been busy working on the 1942 Ford Jeep. The Jeep has been sitting for a while and hasn't run in many years. Andrew is breathing life back into the old girl. Terri and Mike have been a great help around the museum and with the B-25. In preparation for our trip to NAS Fallon they cleaned the interior of the B-25 from the nose to the tail. Recently they straightened up the museum for a bunch of 8th graders who were visiting on a field trip. We had over 60 students show up to learn about aerodynamics and the principles of flight. Thanks to Mike and Terri, the museum was ready for the kids a whole day earlier than scheduled and Terry's artistic touch really made the museum shine. Here Mike is screwing up the B-25. THANK YOU FOR WHAT YOU DID FOR OUR COUNTRY!